All four Capital sides in the CSL Eastern Premiership won on Saturday and there is a real belief amongst the clubs that they can have successful summers. 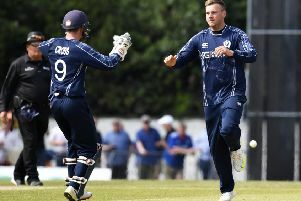 Carlton remain top after a 30-run home win over Glenrothes while Watsonians, Mazars Grange and Heriot’s all had happy road trips home after victories at Stoneywood-Dyce, Arbroath and Aberdeenshire. Carlton batted first at Grange Loan and captain Steve Gilmour made 69 coming in at No.3. Hugo Southwell then continued his good start to the campaign with 96 in a total of 252 all out. Rizwan Akbar was the best bowler for the visitors taking 4-21. In their reply Glenrothes got off to quite a good start, but Omar Ahmad took the key wicket of Chris Greaves for 81 runs and former Scotland captain Gordon Drummond managed to trap Fred Culley LBW for 44. After a valiant run chase the visitors fell 30 runs short, Ahmad leading the way with three wickets for 40 and Calum Everett getting his first top-team wicket as Carlton made it three wins from three. Watsonians skipper Ewan Chalmers was delighted with his side’s batting effort at People’s Park in Aberdeeen against the Stoneywod-Dyce club. The home side batted first and 70 not out from Akhlaq Bashir helped them to post what looked like a competitive 253-4. Andy McKay took two wickets for Watsonians. In their reply Watsonians got off to a flying start with Brendan O’Connell hitting the ball to all parts of the ground. He made 99 while opening partner Mike Carson made 72 not out. Chalmers hit 34 and Andrew Fraser-Harris chipped in with an unbeaten 21. Sonians now have two wins and so do Grange after they were victorious at Arbroath. Nick Farrar (29) and Ryan Flannigan, who went on to make 87, shared a 65-run partnership opening the batting for the Edinburgh side. Scotland captain Preston Mommsen then made a superb 107 not out and Neil McCallum 32 not out as they posted 262-2 at Lochlands. Chris Sole set the tone early in Arbroath’s reply, getting the wicket of Jack Waller, and Grange’s bowlers never let the home side settle. Eventually they were all out for just 119 as Grange came out on top by 143 runs, spinner Harris Aslam taking 3-20. Heriot’s made it a quartet of victories for local clubs as they held on to defeat Aberdeenshire by ten runs at Mannofield. Mark Watt’s 71 and 64 from opener James Hearn helped Heriot’s make 244-8 batting first. Some great early bowling in Aberdeenshire’s reply left the hosts struggling on 92-5. However, Harsha Cooray (93), and 71 from Etienne Botha helped Aberdeenshire recover. Heriot’s skipper Keith Morton took both their wickets as the Goldenacre men held on. In the Baillie Gifford ESCA Championship, Edinburgh went top with a five-wicket home win over Kelso. Bilal Ahmed took 7-24 as the Borderers were all out for just 56. RH Corstorphine edged past Carlton II by three wickets to make it three wins from three. There were also wins for Mazars Grange II and SMRH, but Marchmont lost to Dunnikier.